The ladybug life cycle starts with mom and dad ladybug mating. The ladybugs pictured to the right are mating. Ladybugs reproduce sexually. Each species of ladybug has its own pheromones for attracting a mate. When they find each other, the male grips the female from behind and holds on tight. They can copulate (stay together) for more than 2 hours at a time. Female ladybugs can store a male's sperm for 2-3 months before laying eggs. 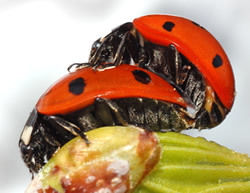 Ladybugs tend to lay their eggs where food is abundant. How do we know the male from the female? It's almost impossible for the average person to tell them apart. But here are some clues that might help. First, females are usually larger than males. Second, if you observe one ladybug riding atop another ladybug, they are in the process of mating. A male ladybug will grab the female's elytra (hard wings) and holds on tight  so the one at the top is the male. 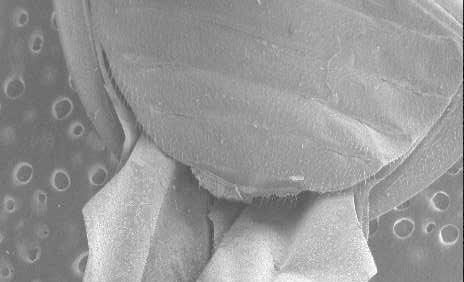 An entomologist (bug scientist) can see the difference between males and females under a microscope. Below are pictures taken with a microscope in a process called electron microscopy. Have a notch on the last sternite, shown by the yellow number 6. They have lots of setae ("hair-like" structures) on the last segment, shown by yellow number 6 . And, they have large flexor bands between the sternites, shown by the arrows above number 3. Do not have lots of setae, just a little. Do not have large flexor bands. 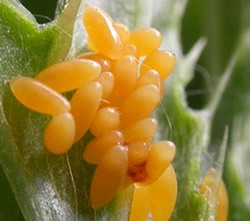 After mating, the ladybugs will deposit eggs like these on leaves.